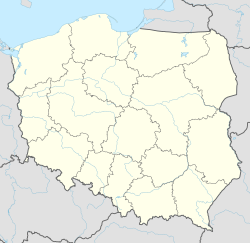 For other places with the same name, see Kępno (disambiguation). Kępno [ˈkɛmpnɔ] ( listen) (German: Kempen in Posen) is a town in Poland. It lies on the outskirts of the Greater Poland Voivodeship, as it borders on Silesia and the Łódz Land. As of December 31, 2009 Kępno had a population of 14,760. One popular attraction in Kępno is the recently restored Rynek (market square). Previously part of the Polish-Lithuanian Commonwealth, Kępno was annexed by the Kingdom of Prussia in the 1793 Second Partition of Poland. Administered within South Prussia from 1793–1807, it was part of the Napoleonic Duchy of Warsaw from 1807-1815. As Kempen, it was restored to Prussia in the 1815 Congress of Vienna and administered within the Grand Duchy of Posen (until 1848) and the Province of Posen, within which it was the seat of the district Kempen in Posen. The town was a 19th-century shtetl. The majority of the Jews left the city during the second half of the 19th century because of the epidemics (cholera, etc.) and the poor living conditions. They left mainly for Breslau (Wroclaw) and surroundings, Berlin, and the Americas. Kempen (Kepno) immigrants were the first Jews to settle in Guatemala, and formed the basis of the German-Jewish community there. On 17 January 1920, after World War I, it became part of the Second Polish Republic. Following the invasion of Poland and the outbreak of the Second World War in September 1939, Kępno was occupied by the Wehrmacht and annexed by Nazi Germany. It was renamed Kempen and administered as part of the county or district (kreis) of the same name within Reichsgau Wartheland. Red Army troops took the town on January 21, 1945 and with the end of the war, the town returned to Poland. ^ "Kępno Population". www.polskawliczbach.pl (in Polish). Retrieved 30 January 2017. Wikimedia Commons has media related to Kępno. This Kępno County location article is a stub. You can help Wikipedia by expanding it.